Purple Mattress may have created one of the best product commercial videos ever. But why does it work? Because, boy, does it work. My wife and I are shopping for a new mattress, and we came across the company Purple. The company uses a new type of mattress that is in stark contrast to memory foam. I have yet to make a decision on whether to buy or not, but during our research, we watched its demonstration video. And, guys, I was floored by how strong and powerful this video is for promoting Purple’s brand and product. 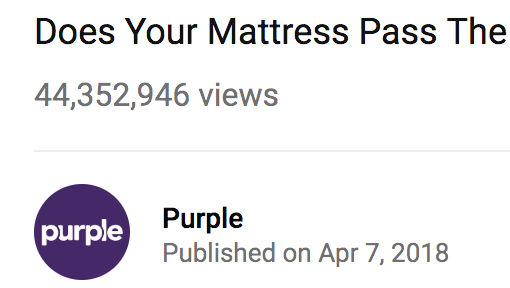 The video begins with a succinct explanation for the purpose and promise of this video: Purple mattresses are far superior to memory foam. And while that line alone serves an important role, the brand is establishing so much more through its visuals, its word choice, and even Purple’s spokesperson. We immediately see we’re in a lab: The set is clearly a place for conducting scientific experiments and our spokesperson wears a white coat. Without saying much, we know the brand will prove its superiority to memory foam through SCIENCE! But not just any kind of science. Funny science. Why do we know that? Two reasons: 1) Our spokesperson uses the word “blows” to describe Purple’s supremacy. Not exactly a scientific term. And 2) freaking Sasquatch is strutting in the background wearing a floral apron! In three short seconds, we know everything we need to know about Purple’s personality, its style, and its confidence. Why wouldn’t we keep watching?? We’ve all seen the mattress commercials where someone drops an egg from 10 feet above the mattress or jumps on the bed while a glass of wine sits precariously close by. And, yes, even Purple couldn’t resist demonstrating the standard mattress tests to prove their prowess. These tests are crucial for consumers to understand a mattress’s quality, but Purple realized that tests don’t have to be boring. Within this video, Purple walks us through three separate tests: the egg test, the heat test, and the durability test. Yet each one either has a comedic twist to it (the egg test becomes the H.E.D. test, or Human Egg Drop test) or combines interesting visuals plus awkward-funny dialogue from our spokesperson. In both cases, you’re learning while being entertained. Heck, by the time you’re finished watching, you’ll walk away knowing memory foam was invented in the 1960s. I believe Purple has created a truly standout commercial for its product. And I believe the 44 million other people who have seen the video agree. Is this a doable project for your brand? Absolutely. But the humor is not what makes the video work. That’s just a means to an end. What makes this video work is that Purple is able to combine education with entertainment and has done so through harnessing a sense of humor that appeals to its target audience. The comedy is what makes this video entertaining, true, but entertainment in general is not dependent on comedy. Brands must tell stories that connect with their consumers. Not all consumers. Just the right consumers. Maybe that means appealing to your consumers’ fondness for nostalgia, or their passion for patriotism, or their love of family, or, yes, their awkward senses of humor. When you can find the angle that resonates with your consumers and aligns with your brand’s core values, you’ll have an entertaining and educational message that inspires action. I am an experienced, professional copywriter and digital marketing consultant located in Little Rock, Arkansas. I provide my exceptional skills for freelance and contract projects. To learn more about my services and pricing, please contact me. © 2019 RhenWilson.com was designed and developed by me.